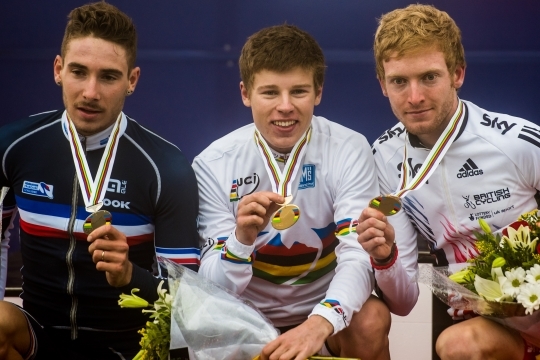 New Zealand rider Anton Cooper has won the under-23 cross-country title at the UCI Mountain Bike World Championships in Andorra today. Cooper, from Woodend in North Canterbury, rode from the front in wet and muddy conditions to win in a sprint finish. It's Cooper’s second World Title after winning the Junior Championship in 2012.
Cooper, who turned 21 last month, certainly came of age as a mountain biker with a brilliant ride from the front in challenging conditions on a brutally tough course at altitude. “To win both the under-23 title and junior world titles is something to be proud of,” the Cannondale professional said. “I did struggle this year to find the top step of the podium. I had some great results – fourth, fifth and fifth again in the World Cups - but just not that win and so to find that at the World Champs is truly special. Cooper, usually a conservative starter, found himself in the lead off the front row at the head of a five-strong bunch including Frenchman Victor Koretzky, the 2011 junior World Champion, Great Britain’s Grant Ferguson, the World Cup winner last month in Italy, and Sam Gaze (NZL). Cooper and Koretzky opened up a 13 second gap going into the fifth and final lap with Ferguson mounting a charge from behind and the Frenchman with a noted sprint finish. Koretzky finished just two seconds behind with Ferguson 22 seconds back and Gaze held on for a highly creditable fourth placing. “I felt so strong in the hills and just tried to ride the downhills conservatively and limit my mistakes and I was able to do that. There is depth and pace in the under-23 field so to win a world title in the under-23s is a huge confidence boost. It is almost like an elite race, just the day before,” said Cooper. He said that the leading under-23 riders this year have been riding at a pace with the top of the elite men’s fields on courses where the conditions have been similar. Cooper already has his sights set on the big prize of selection for next year’s Rio Olympics. CAPTION: Anton Cooper celebrates victory on the podium at the UCI Mountain Bike World championships in Andorra today.